Owen Wilson briefly appeared at last night's premiere of his film "The Darjeeling Limited," stepping out for the first time since his attempted suicide. Owen's friends and co-stars gave him a warm welcome at the Academy of Motion Picture Arts and Sciences in Beverly Hills, where the film was screened. Director Wes Anderson introduced Owen as his "best friend," and called him "somebody I've never made a movie without and hope to never make a movie without." The audience applauded as Owen took the stage, looking happy and healthy in a dark suit and white shirt. 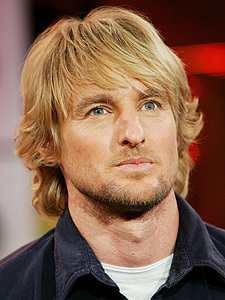 Instead of speaking, Owen stood proudly next to fellow co-stars Jason Schwartzman, Natalie Portman and Anjelica Huston. After the screening, Owen was reportedly seen hugging other actors.